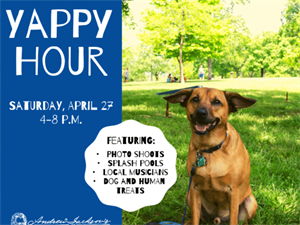 Bring out your favorite canine and enjoy Yappy Hour on the lawn of The Hermitage! Guests will have exclusive after-hours access with their dogs to explore the grounds and gardens. You’ll want to make sure they smell every tree, roll on the lawn and enjoy an outdoor lounge complete with a fenced-in dog park and splash pools to cool down. Exclusive canine photo shoots on the mansion lawn with WJ Photography will be available for purchase, along with dog-friendly food treats courtesy of Nom Nom Dog Treats along with human food and beer options from Nashville’s local food trucks. Local acoustic musicians will complete the ambiance of this exclusive evening at the president’s house! Don’t have your own canine yet? We’ll also have local animal rescues with (adoptable!) dogs for you to play and walk the grounds with!